Johannesburg (South Africa) – Africa’s biggest and best mixed martial arts show is back in less than two weeks! 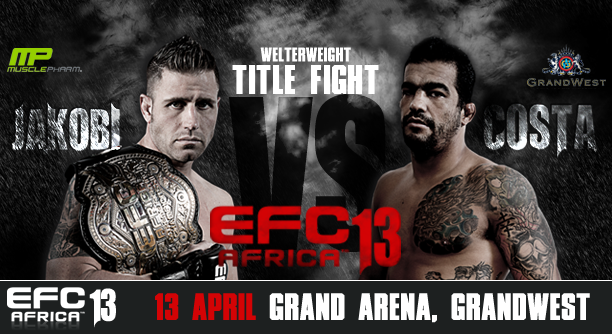 On Friday 13 April, the GrandWest Grand Arena will erupt with excitement as EFC AFRICA 13 pits the continent’s finest warriors against each other. The main event of the evening sees Cape Town’s Jadyson Costa challenge reigning champion Dallas Jakobi for the EFC AFRICA welterweight title. 12 more hard-hitting bouts await in this revolutionary combat sport event! Live event – all 13 bouts: GrandWest’s Grand Arena hosts Cape Town’s first ever EFC AFRICA event with unparalleled view, sound, lighting and atmosphere. Tickets for the live event are still available at Computicket www.computicket.com Doors open at 5pm, first fight starts at 5:40pm. Online pay-per-view – all 13 bouts: All the action of Africa’s biggest MMA event is just a click away at www.shop.efcafrica.com View EFC AFRICA 13’s first two undercard fights at no charge, then purchase bouts three to ten for R95, eleven to thirteen for R125, or the entire undercard and main card combined for R195. Once purchased, fights can be viewed as many times as you like within 24 hours. Fights will be available for purchase before, during and after the event takes place.